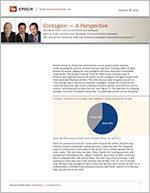 Contagion—A Perspective - Epoch Investment Partners, Inc. Recent events in China have sent tremors across global equity markets. Understanding the sources of these tremors and their interplay with our twin themes of secular stagnation and contagion will have important investment implications. The Global Financial Crisis of 2008/9 was manufactured in America and exported around the world via the contagion of highly levered and interconnected financial entities. This time the epicenter of global concern is China except that it will be an economic contagion instead of a financial one. China has been the main driver of global economic growth since the turn of the century, and especially so since the GFC (see Figure 1). The idea that it is slowing, perhaps more than its leaders would like, is unsettling markets across the globe. Think of a series of concentric circles with China at the center. The first ring contains China’s commodity trading partners. China has been the marginal buyer of nearly every commodity in the world. Their outlook appears dire in many cases. The next ring includes China’s Pacific Rim trading partners and competitors including Korea, Taiwan, Vietnam, and a host of other countries. Much unpleasantness will unfold there. The next ring contains Europe; it will experience some pain but it will certainly not be fatal. The U.S. sits in the last ring. Perhaps close enough to catch a mild cold but not much worse, as the U.S. is predominantly a domestically focused economy with direct exports to China less than one percent of our GDP. Growth in China matters to the world as it is the third largest global economy after the U.S. and the European Union. Lowered expectations there will negatively affect economic growth expectations in the developed world as well as emerging economies. Weak first-half GDP data in the U.S., Europe, and Japan have combined with the notion that China’s economy is cooling off more than most people thought, making the latter geography the epicenter of lowered expectations. Stock markets around the world are adjusting. Coming out of the 2008 Global Financial Crisis, China’s government intervened more aggressively than other governments, quadrupling debt from 7 billion RMB to 28 billion RMB. This policy amounted to state directed mal-investment on an unprecedented scale and made China the world’s engine of growth. The country effectively became the marginal buyer of just about everything. This mal-investment could be seen on roads to nowhere, airports with no planes, apartment buildings without dwellers, and industrial plants with no customers. This massive spend lifted export-driven economies globally and benefitted commodity exporters in particular. Fast forward to today. The HSBC/Markit PMI shows that Chinese factories have cut jobs for 20 consecutive months. Real estate prices have been in a long slide. Retail prices are slipping and June auto sales were dismal. Indeed, auto sales in China this year may be down year over year. If that happens, it will be the first decline in 17 years. Whatever the precise trajectory of China’s growth rate, almost everyone agrees it is going down. Although observers widely expected China to undertake a transition from investment to consumption, how it would sustain spending during the transition was never clear. As Paul Krugman pointed out, the Chinese first accelerated infrastructure spending by funding cheap credit to the SOEs (State Owned Enterprises). This led to a rapid run-up in the debt of these enterprises, which by last year was high enough to raise worries about financial stability. China’s overall debt-to-GDP ratio has climbed faster than any country in the world since the Global Financial Crisis (see Figure 3). This chain of events — the end of surplus labor, the deteriorating marginal efficiency of capital deployed, the rise of debt and a stock market bubble — all suggest that the world’s third largest economic superpower has become increasingly unstable with a visible downward growth rate trajectory. The recently announced currency devaluations brought these events to the front page. The currency had become overvalued and the moves were in line with China’s goal of moving toward more open market policies, but these events were viewed by many as the latest in a series of frantic attempts to support the economy. This undermined confidence in the economy and the government’s ability to manage it. Turning to Europe, despite ratcheting up quantitative easing last autumn, Europe’s economic growth rate remains tepid. Second-quarter GDP growth was slower than that of Q1, rising only 0.3%. Demographics and productivity numbers reinforce the fact that Europe’s growth rate will remain very low, notwithstanding the favorable change in its currency relative to other world currencies. The relative attractive valuation levels that existed in the securities markets have been addressed this year and the political contagion from a potential Greek exit from the euro zone seems to have been muted. For the U.S., the real GDP growth rate in the first half now appears to be only a little more than 2%. Retail sales are up only 1.4%. Exclude auto sales, and the number is down to zero. Investors have been hoping for greater capital spending by U.S. corporations building on the improving trends in employment. Alas, U.S. firms are investing little. There remains slack in labor and manufacturing capacity so that hope is being dashed. Take tech spending for example. In the past few weeks, tech companies have been taking down their second-half forecasts. Below is an excerpt from Fred Hickey’s August 4 High Tech Strategist letter, which captures the current environment in the technology industry. The global IT (information technology) market was sucking wind this year even before the recent events in China and elsewhere made IT end markets that much worse. Enterprise IT was weak on the continuing lack of corporate capital spending. Device sales (PCs and tablets) were also slowing sharply, as were smartphones with the exception of Apple’s, as Apple was in the midst of a huge product upgrade cycle (iPhone 6). Nevertheless, forecasters expected some year-over-year growth in IT spending, as certain IT segments remained firm on steady to strong demand from end markets such as industrial, autos and cloud computing data centers. However, as the global economy has weakened, one by one the strong end markets have succumbed to the slowdown pressures, leaving virtually no end markets for tech unscathed as we begin the third quarter. With respect to emerging markets there is little good to say. Depressed end markets for their products combined with significant debts denominated in foreign currencies, principally the dollar, spell real trouble for many of these countries. The standard of living within these geographies is likely to decline and regime change is not out of the question. A slowing of global growth is upon us. It is likely to reflect some form of secular stagnation rather than a reaction to a temporary buildup of global debt by developed countries and China. China is the epicenter but neither Europe nor the U.S. is experiencing satisfactory growth either. The U.S. economy is growing at around 2%, Europe less than 1%, Japan about 1%, and China is up as well but at what rate we do not know. As far as emerging markets are concerned, their outlook is bleak in many cases given the state of their export markets and their current account deficits funded in external currencies (mainly the dollar). It is hard to see how the world’s real growth rate can accelerate given this “tone” on the ground. As a result, the yield curve may even shift downward and any near- term rate hike by the Federal Reserve will be postponed. Finding relative value is never easy in times like the present, but it will be visible in those companies generating free cash flow and possessing managements that have a history of wise capital allocation. Value will not be found in passive strategies where large proportions of the names have no earnings and no EBITDA. Indeed, mispricing opportunities arise in volatile markets and those investors with longer holding periods will benefit.